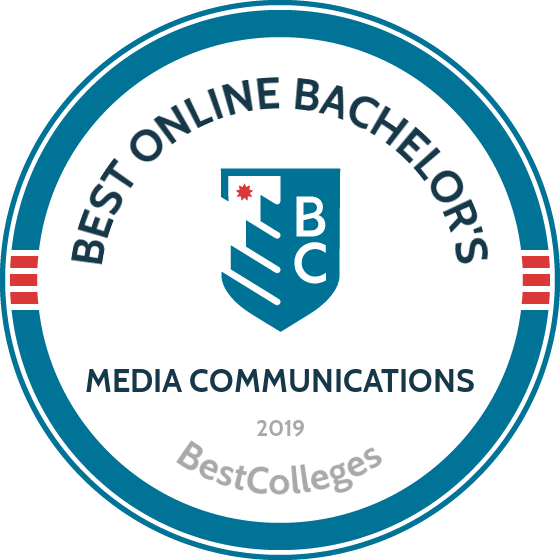 What Are The Best Online Bachelor's in Media Communications Programs? What Else Can I Expect From an Online Bachelor's in Media Communications Program? An education in media and communications provides a path to fast-paced careers in broadcasting, sound engineering, and public relations. Demand for professionals in these areas is increasing, with media industry jobs expected to grow by more than 27,000 by 2024. Plus, the median salary for these careers is well above the national average. The first step to beginning your career in the field is earning an affordable and convenient online bachelor's in media communication. Choosing the right communication and media studies program is crucial to your success in the field. Core coursework typically incorporates journalism, digital media technology, intercultural communication, and PR and advertising. Media communication studies programs allow students to customize their degree through concentrations; aspiring scriptwriters or broadcasters may specialize in English or journalism, while business minors may focus on media sales or marketing. Those interested in incorporating liberal arts studies may focus on psychology of the mass media or global communication, and creative concentrations often include photography, motion graphics, and audio production. Ensure your chosen program offers the specialization you're most interested in. Most bachelor's degrees in media communications require an internship or immersive experience, along with a culminating capstone project. Located in Webster Groves, Missouri, Webster University is a nonprofit, private institution established in 1915. The school serves 22,000 students and offers an online media communications degree. Webster boasts a worldwide network of 170,000 alums, and students earn the degree online or in a hybrid format. The curriculum focuses on media theory, writing, and production. Upon completion of the program, students offer critical interpretations of media messages, understand media strategies, and demonstrate creative problem solving. Bachelor's students need at least 128 credits for graduation. Additionally, during their third year, distance learners pass a portfolio review. Required courses consist of 39 credits and include classes such as introduction to media production, mass communications, media writing, media literacy, law and media, interpersonal communications, and fundamentals of reporting. The remaining credits come from applicable global citizenship program hours and electives. Degree seekers also complete a capstone course and must earn a grade of B or higher. Webster distance learners also choose a 12-credit concentration area offered by the School of Communications. Prospective students must submit a completed online application, an application fee, high school transcripts, and their ACT or SAT scores. Successful applicants possess a 3.0 GPA or higher and a 21 or 1000 on the ACT or SAT, respectively. Webster also prefers that applicants rank in the top 50% of their high school class. Available Concentrations: Advertising; animation; audio production; film studies; video production; game design; global journalism; interactive digital media; audio production; journalism; photography; professional writing; public relations; scriptwriting; speech and communication studies; sports communication. Established in 1885 and located in Tempe, ASU serves over 80,000 students and is one of the largest public universities in the U.S. Distance learners take advantage of ASU's online bachelor of arts in mass communications and media studies. This online degree prepares learners for careers in business, government, journalism, and marketing, as well as work in both the public and private sectors. ASU learners develop transferable skills that employers value in virtually any modern field. This curriculum focuses on the importance, effectiveness, influence, and transient nature of media in the U.S. and around the world. Required courses include media and society, literacy and critical inquiry, global awareness, digital audience analysis, and digital media literacy. Students choose several electives to tailor the degree to fit their academic and professional needs. Many ASU students select classes that focus on American popular culture, international media studies, or social media. Each class for distance students pursuing an online media communications degree lasts 7.5 weeks. In total, degree seekers complete 41 courses or 120 credits. Full-time students typically complete the program in four years or fewer. Some students gain acceptance to the fast-track program, which allows online learners to finish their degree in three years. Those interested in the fast-track program must speak with an adviser before applying. Prospective students submit their ACT or SAT scores, high school transcripts, and an online application. Successful applicants typically possess a 3.0 GPA or higher, a 22 on the ACT, a 1120 on the SAT, or rank in the top 25% of their graduating high school class. Regent is a private Christian research university located in Virginia Beach. The school offers an online bachelor of arts in communication studies with a concentration in internet and social media. Distance learners in this program explore digital marketing and social media techniques, effective written communication, and interactive media. Students develop highly valued and current skills such as web development and content creation. Graduates with Regent's online media communications degree move on to careers as social media strategists, digital media strategists, internet marketers, and web content developers. Learners need 120 credits for graduation. Each course lasts eight weeks. Online students complete various religion courses such as Old Testament studies, New Testament studies, Christian thought and history, and Christian leadership. Required courses for the communication studies major at Regent include marketing principles, communication theory, principles of journalism, and introduction to digital art. Accepted students take advantage of various student resources through the Office of Career and Talent Management; learners may also participate in free personal and academic counseling sessions. Additionally, regent provides specialty services through multiple centers on campus, such as the Center for Student Happiness, the Institute for Cybersecurity, the Military Resource Center, and the Center for Entrepreneurship. Applications for students under the age of 24 need only include high school transcripts, ACT or SAT scores, and a personal statement. Learners 24 and older do not submit standardized test scores. Regent holds regional accreditation from the Southern Association of Colleges and School. A private university located in Chicago, DePaul boasts over 21,000 students and offers two- and three-year degree completion programs for learners interested in its bachelor of arts in communication and media program. This degree completion program requires all incoming students to possess 30 credit hours or more with a minimum 2.0 GPA. In total, distance students need 192 quarter hours for graduation. Applicants' transcripts must reflect a history of college-level courses in English composition and mathematics. Incoming students with approximately 30-65 college credits follow the three-year track; those with 66 credits or more follow the two-year track. As a result, DePaul registers all distance learners in this program as transfer students. Additional bachelor's degree requirements include completion of the scientific inquiry lab science course, a foreign language, and an English composition course. Incoming online media communications degree seekers may attempt a CLEP credit by exam for each requirement. Prospective transfer students under the age of 23 with fewer than 30 semester credits need to submit ACT or SAT scores along with their high school transcripts. Learners age 24 and older do not need to submit transcripts unless they possess fewer than 12 credits. In either case, the latter group does not submit standardized test scores with their application. Admitted students receive a transfer counselor to help them make the transition into the communication and media program. Applicants may contact an admissions counselor if they have questions throughout the application process. Founded in 1878, Brenau is a private nonprofit institution in Gainesville, Georgia. The small school boasts 3,500 students and offers associate, bachelor's, master's, and doctoral degrees. Online learners may pursue Brenau's bachelor of arts in communication and media studies with no on-campus obligation. Brenau provides learners with the essential tools for careers in public relations, marketing, fundraising, data analysis, and event planning. Graduates of the program also move on to careers in project management, quality assurance, instructional design, consulting, and recruiting. Distance learners at Brenau complete a liberal arts education with four parts: scientific and analytic curiosity, world understanding, artistic and creative imagination, and communication and language fluency. Students take 1-2 classes from each category in addition to other foundational courses, such as film appreciation, fundamentals of speech, and persuasion. Required major classes for the degree include both introductory and advanced courses in new media development, international media systems, public relations campaigns, intercultural communication, and effective interpersonal communication. In total, learners need 120 credits for the online media communications degree. Brenau distance learners can take advantage of career coaching and advising experts, participate in Greek life, or take part in the Student Government Association. Career services include cover letter critiques, mock interviews, assistance with graduate school applications, job fair access, and salary negotiation guidance. Prospective students must submit their college transcripts if they possess fewer than 30 credit hours. Incoming students direct from high school need a 2.75 GPA or higher while college transfer students need at least a 2.0. UofM is a public research institution with more than 21,000 students. Established in 1912, the school offers an online bachelor of arts in communication that helps students develop a better understanding of communication and related skills across a series of careers and social contexts. Online media communication degree seekers need 120 credits for graduation. Learners complete all classes online with no on-campus obligations or in a hybrid format. The five areas in which communications studies majors develop their skill set include performance, analysis and critical thinking, knowledge, ethics, and mediated communications. In sum, UofM helps students understand the significance of media forms in communication processes, daily life, and professional business contexts. Required core classes for online communications majors include media and information literacy, communication ethics, communication research methods, and rhetoric controversy. Approximately nine credits come from the student's chosen concentration area. Currently available concentrations at UofM include professional and relational communication, rhetoric and public advocacy, and media and culture. Additionally, all degree seekers complete a capstone project during their final year. Prospective students must submit their ACT or SAT scores along with high school transcripts. UofM offers early decision applications for outstanding high school juniors, provided they possess a 3.5 GPA. These applicants also participate in an interview and submit written recommendations from their high school principal and guidance counselor. Students secure financial aid through the federal government and the school's scholarships office. UofM also offers several hundred merit-based scholarships for incoming freshman each year. Oswego is a liberal arts college that officially joined the State University of New York system in 1948. The school boasts 8,000 students, 80,000 alumni, and two campuses in Oswego and Syracuse. Distance learners can take advantage of Oswego's online bachelor of arts in broadcasting and mass communication. The program teaches students the practical production, writing, and media skills they need for successful careers. The curriculum covers audio and video production, copywriting, media management, and broadcast journalism. Online learners may take part in Oswego's clubs, organizations, and community service activities. Additionally, the school offers career coaching, online tutoring, and job application preparation services. The counseling services center provides free individual and group counseling. Faculty deliver synchronous courses through the Blackboard system. Required core courses for the online media communications degree include foundations of communication, introduction to mass media, electronic media sales and marketing, and public speaking. Of the 120 required credits for graduation, online learners choose 15 credits of electives. Incoming students may transfer up to 60 credits from two-year colleges and up to 90 from four-year institutions. Incoming students must submit their SAT or ACT scores along with their high school transcripts. Successful applicants typically score 22-26 or 1155 on the ACT or SAT, respectively. Transcripts must show a history of college preparatory classes in mathematics and one foreign language. Oswego offers an early admission program for advanced high school learners in their third year. A letter of recommendation from the student's high school counselor must accompany these applications. SNHU is a private nonprofit institution founded in 1932. The school boasts over 90,000 students on campus and online. Distance learners can take advantage of its online bachelor of arts in communications and new media. Learners pursuing this online media communications degree focus on producing writing and content for new media platforms, including social media and online news sources. The curriculum covers popular subject areas in the field such as new media technology, mediated environments and interpersonal development, social media research and marketing, and content production for modern platforms. Required courses for new media students include business communication, public speaking, graphics and layouts, social media marketing strategies, and organizational communication. Learners also follow one of three tracks: new media, professional writing, or public relations, the latter of which requires a senior capstone project illustrating the degree seeker's understanding of public relations campaigns. SNHU graduates enter careers in virtually any field that relies on new technologies to promote products, companies, or individuals. Upon graduation, SNHU students often pursue jobs in management, communications, public relations, media, and advertising. SNHU features an asynchronous, self-paced program that allows new media students to complete their work at their own pace over six, eight-week terms per academic year. This online curriculum includes 24/7 remote access to course materials, library resources, technical support, and online tutoring. Applicants with higher GPAs possess a better chance of receiving an internal, merit-based scholarship. SNHU holds regional accreditation from the New England Association of Schools and Colleges. Established in 1914, UTEP is a public research institution serving over 25,000 students. The school boasts the second-largest Mexican American student population of universities in the U.S. The university offers online students a bachelor of arts in media advertising program. Faculty deliver synchronous courses through the school's UTEP Connect software. The program welcomes new learners with no prior experience in media advertising who wish to enter key roles in today's progressive media and advertising industries. The curriculum also offers collaborative opportunities for online learners with their peers to create a more traditional learning culture. Students focus on understanding the communication and media channels through which professionals implement marketing campaigns. Additionally, they develop the necessary skills to examine consumer behaviors and communicate effectively with their colleagues and clients. Students need 120 credits for graduation, including 18 credit hours of core coursework in media advertising. Required courses include introduction to communication studies, integrated marketing communication, new media advertising, and media planning and buying. Prospective students must submit a completed online application, official high school transcripts, and ACT or SAT scores. Upon graduation, UTEP alumni typically pursue careers at nonprofits, businesses, and government agencies. Graduates also secure jobs with communication and marketing departments in virtually any type of industry. Many graduates find work as account assistants, marketing researchers, media buyers, public relations directors, or project managers. Others lean toward more creative roles as copywriters, campaign designers, and creative directors. The media advertising program is an affiliate of the American Advertising Federation. Established in 1927, MSU Billings is a public university. With approximately 4,500 students, it is the third-largest institution of higher education in Montana. Online students may take advantage of the school's bachelor of arts in communication program, which offers two concentrations: organizational communication and mass communication. The organizational communication concentration examines business and communication skills necessary in organizational situations. Students learn about increasing their productivity, organizational skills, and interpersonal connections in the field. Graduates with training in this concentration enter careers as business managers and human resource officers. Degree seekers in the mass communication concentration learn how to implement effective communication strategies and how to construct messages for various media outlets. This concentration offers a theoretical approach to communications and prepares students for work as public relations assistants, news reporters, journalists, and copy editors. Successful applicants typically possess a 2.5 GPA or higher or rank in the top 50% of their high school graduating class. Additionally, prospective students need to submit their ACT or SAT scores. MSU Billings favors applicants with at least a 22 or 1030 on the ACT or SAT, respectively. Incoming students may transfer credits toward their bachelor's degree, provided their previous credits come from an accredited college or university. Academic advisers evaluate transfer students' transcripts after they apply for admission. Student services for distance learners include career services, online tutoring, academic and personal counseling, and class registration assistance. MSU Billings' online students receive financial aid through federal or state sources and may also apply for internal, merit-based awards at the university. Loyno is a private university established in 1904. The school boasts approximately 5,000 students and offers a bachelor of arts in mass communication. The program helps distance learners develop journalistic skills for careers in broadcasting, advertising, public relations, and visual communication. In this online media communications degree, distance learners not only cultivate strong writing, videography, photography, and social media skills, but they also learn how to apply said skills in various professional settings. Loyno mass communications students prepare for work in nonprofit organizations, government, and the private sector. In addition to the general education core class and 48 credit hours of mass communication studies, degree seekers follow a sequence of 25 credits in one of four subfields: journalism, visual communication, public relations, or advertising. Major-specific required classes include introduction to mass communication, media writing, law of mass communication, and mass communication ethics. Students also choose from popular electives such as sports promotion, digital communication, social media strategies, and hands-on communications work at the Brand Lab. Distance learners concentrating in journalism complete a capstone project during their final year. Applicants with no college experience must submit official high school transcripts and ACT or SAT scores. Incoming students may transfer up to 64 college credits (from regionally accredited two-year institutions) toward their Loyno bachelor's degree. At least 25% of a student's total credits must come from coursework at Loyno. In total, degree seekers need 120 credits for graduation. Students need to maintain a 2.0 GPA to remain in good standing. Established in 1972, GSC is a public college in Concord, New Hampshire, that holds regional accreditation from the New England Commission on Higher Education. Online students may pursue its online bachelor of science in communication studies, which offers theoretical approaches to understanding communication among individuals, small groups, and mass media. This program allows students to cultivate analytical skills commonly used in the field. Learners hone their public speaking and writing skills while examining examples of effective communications, marketing, and campaign strategies. Required core courses include classes in areas such as quantitative inquiry, social science, and English composition. Major-specific required classes -- such as website development, introduction to ethics, and managing conflict -- require a grade of C or higher to count toward the degree. Students pursuing this online media communications degree must complete at least 120 credits for graduation. While incoming students may transfer credits from accredited colleges toward this bachelor's degree, at least 30 of their total credits must come from GSC classes. Incoming students may receive credit for passing scores on the CLEP, DSST, or Excelsior examinations; experiential learning; or military training. Degree seekers must maintain a 2.0 GPA to remain in good standing with the department. Distance learners enjoy tutoring and counseling services no matter their location. Students schedule individual advising sessions and use GSC's online career planning system, Kuder Journey. Degree seekers also pursue internships and practicums in their area to gain hands-on experience in the field. In some cases, they earn credits toward the bachelor's degree. MACU is a small liberal arts college in Oklahoma City with approximately 2,600 students. The school, affiliated with the Church of God, offers an online bachelor of science in communication, media, and ethics. MACU offers fully online and hybrid course formats. In this program, learners acquire the necessary knowledge to use online tools and social media to benefit their employers and careers. The curriculum examines online media consumption and production, marketing, social persuasion, and audience perception. Additionally, learners complete a series of major-specific classes centered on theory and practice, communication practices, digital media literacy, and the cultural aspects of media consumption. Students need 122 credit hours for graduation. Full-time online degree seekers complete the program in four years or fewer. Military and veterans often transfer credit toward the degree based on military experience (with no maximum number of transfer credits for military personnel). Additionally, these online learners also take advantage of a 15% tuition discount. Prospective MACU students with military experience should contact a student veteran specialist for application and transfer credit assistance. Distance learners interested in pursuing an online media communications degree need only to submit their high school transcripts and a completed application. MACU offers online library access, librarian chat features, and research help for all distance learners. Students may also seek out free personal and academic counseling either on campus or over the phone. Finally, online students may apply for financial aid through state and federal sources using the FAFSA. Founded in 1962, Lynn is a private institution with approximately 3,000 students. The school offers associate, bachelor's, master's, and doctoral degrees on campus and online. Distance learners pursue its bachelor of arts in communication and media. Lynn prides itself on offering instruction by industry experts who possess real-world knowledge of media and communications fields. Many professors in this department held jobs as reporters, product managers, public relations specialists, screenwriters, and network producers. From analyzing media trends to executing content production, these educators ensure that Lynn communications and media students develop the essential skills for a successful career. The core- and major-specific curricula help students acquire a theoretical foundation for understanding the role of media in society. Required core classes include personal finance and statistics, English composition, ethical decision-making, presentational communication and technology, and computer applications. Degree seekers complete 45 credits of major courses such as nonprofit public relations, persuasion and propaganda, communication law and ethics, communication strategies and performance, and photojournalism. Prospective students need only submit a completed application, personal statement, and official transcripts for consideration. Incoming students may transfer credits from previous college courses, AP courses, or CLEP tests. Lynn assesses academic records on a case-by-case basis after students gain admission to its program. Learners who earn the online media communications degree at Lynn gain access to various internship opportunities at major companies such as MTV, Telemundo, Boca Magazine, and Palm Beach Post. Lynn graduates seek out careers as journalists, marketing specialists, media planners, videographers, and speechwriters. In recent history, graduates secured positions with companies including the Four Seasons, HBO, WCBS Channel 2 New York, and Megalomedia. Located in Boston, Massachusetts, Fisher is a private nonprofit institution that offers an online bachelor of arts in communication for distance learners. The curriculum focuses on the writing, speaking, video-editing, analytical, and problem-solving skills necessary for professional careers in communication and media. Upon graduation, students with the online media communications degree possess a foundational understanding of the field and the written and verbal communication skills to succeed in business, journalism, advertising, or graduate school. Fisher offers communication students a combination of instruction in advertising, public relations, and journalism. Degree seekers need 120 credits for graduation. In addition to general education classes, students complete classes on human communications, mass communications, public speaking, media writing, and digital video production. Fisher allows students to take a significant number of elective credits during their final year, which helps them tailor the degree to fit their educational and professional needs. Communication and media majors typically pursue internships around Boston at television stations, radio stations, production houses, newspapers, and advertising agencies. Recently, Fisher students secured virtual or in-person internships with various nonprofit organizations like Boston City TV, Boston Parks and Recreation, and popular radio stations. Prospective students need to submit their ACT or SAT scores, official transcripts, and a completed online application form. Students transferring from another college or university must schedule an interview with an admissions counselor before applying. Students also apply for financial aid with the FAFSA and individual applications for internal grants and scholarships. Most awards funded by Fisher require learners to demonstrate financial need. With the range of possible specializations, program details vary by school and specific course of study. Most bachelor's degrees in media communications introduce first-year students to core concepts through foundational coursework. While course topics vary by program, online bachelor's in media communication programs typically combine liberal studies, humanities, and business concepts. Programs typically offer a range of electives to tailor the degree to students' interests. Below are a few courses common in media communication programs. New media tools: This course examines digital and online communication tools, including streaming audio and video, text, and image-based apps and platforms. Students evaluate and compare new and old methods of communicating and build problem-solving skills through interactive class projects. English composition: This course exposes students to formal writing. The coursework emphasizes logical compositional structure and rhetorical cohesiveness, and students learn to develop ideas and cultivate a distinct writing style. Aesthetics and theory of communications: This bridge course blends visual arts and socio-psychological concepts, exploring the aesthetics of engaging and appealing to an audience, along with the psychological implications. New media formats: Using interactive technologies and web-based editing tools, this course encourages students to explore nonconventional methods of digital creation and communication. Students create commercials, music videos, and short films. Intellectual property: Addressing business and legal aspects of media communications, this course teaches students how to use trademarks, copyrights, publicity rights, and patents. Students learn how to protect the ownership, licensing, and transfer of rights of their intellectual property throughout the creative process. HOW LONG DOES IT TAKE TO GET AN ONLINE BACHELOR'S IN MEDIA COMMUNICATIONS? The time required to complete an online bachelor's in media communications is impacted by whether the student studies full- or part-time, the course delivery methods, and specific program options. Earning a communication and media studies degree with a business or PR concentration may take less time to complete than a program that combines psychology and communications, due to clinical and research-intensive requirements. Most online bachelor's degrees are either individually paced or cohort-based. Some schools implement one method for all programs, while others utilize different methods for each program. While the number of required credits vary, most bachelor's degrees in media communications comprise about 120 credits and are designed to be completed in four years, although some accelerated programs may be completed in two. When selecting a program, choose a school with current accreditation. Any legitimate college or university will be accredited by an agency such as the Higher Learning Commission. Regional accreditation is the most rigorous and common type of accreditation. However, if you plan to transfer credits, consider a nationally accredited institution, as they typically accept credit from regionally or nationally accredited institutions. Regionally accredited schools, on the other hand, rarely honor credits from nationally accredited institutions. Some media and communications programs may be individually accredited by the Accrediting Council on Education in Journalism and Mass Communications. Check your school's accreditation on the DOE or on CHEA websites. Graduates with a bachelor's in media communications degree earn higher salaries than peers without a bachelor's degree. With mid-career salaries starting at $51,000 per year, jobs in media and communications span a range of fields and industries. Below are common careers for graduates of online bachelor's in media communication programs. Average salaries for careers in media communications vary wildly. Even in cities like New York and Houston, where communications and media jobs are especially abundant, average salaries can vary by more than $57,000, depending on a candidate's experience and education. The U.S. cities listed below are the most popular for graduates with a bachelor's degree in communications. A degree in media communications opens the door to the career of your choice. Graduates of bachelor's in media communications programs find employment in broadcasting, production, and PR, with endless opportunities to secure niche positions within these fields. Below are a few common media communications careers. These professionals typically have at least a bachelor's degree in communications or journalism. They research and present news stories, either behind the scenes or as an on-air personality. Along with a bachelor's degree in communications, these careers require specialized training in cinematography, film theory, digital camera operation, and/or video-editing software. Video editors and camera operators capture and manipulate the images that comprise TV shows, films, and news programs. Employers prefer PR specialists with a bachelor's degree in communications, English, journalism, or business. PR specialists cultivate a positive public image for their clients, utilizing various types of media. Unlike creative writers, technical writers communicate complex technical information. They draft materials such as instruction manuals and how-to guides. Writers and authors are crucial to all forms of media, from advertising to books to movie scripts. Writers typically study English, journalism, or communications and gain professional experience through internships and freelance writing. There are countless professional organizations in the field of media and communications, each providing a wealth of networking, leadership, and professional development opportunities. Members of professional organizations stay apprised of the latest industry trends by attending conventions, seminars, and conferences. Below are premier national organizations for communications media professionals. AMCP develops and oversees several prestigious international marketing and communications competitions, which reward professionals for outstanding achievements in corporate marketing and advertising, PR, design, and production. Through leadership development and by supporting scholarships and educational research for women in communications, the AWC supports pay equity and freedom of information. IAMCR is the preeminent professional organization for global research and development of media communications. IAMCR advocates on behalf of emerging scholars, women, and aspiring professionals from economically disadvantaged areas. NCA members explore the cultural, psycho-sociological, and anthropological aspects of media communications. Members join up to three sections or divisions, grouped by interests and professional settings, and participate in the organization's caucuses. When determining the best way to finance your online bachelor's in media communications, begin by completing the Free Application for Federal Student Aid (FAFSA). Whether you pursue scholarships, loans, grants, and/or work-study funding, completing the FAFSA helps you and your family understand federal funding opportunities and allows your school to evaluate your eligibility for financing programs. Communications programs often provide scholarship and grant opportunities for students meeting certain criteria—such low-income or minority students—or for those planning to pursue certain specializations.